← Do you think life has a pause button? He reached for the sticker decorated bottle, stuck his little finger inside, and pulled out something wonderful: a short letter he said B had sent me from heaven. Of course, I could see that T wrote this message himself, with his uneven lines and curved letters falling off the page. Yet, it was a gift “from heaven.” Just to think that T could put together something so special, for me, truly amazes me. Without revealing too much, the message simply stated something along the lines of, “….you are a good mom….from heaven…love B…” Lost it, right then, right there followed by a much-needed cry and a much-needed hug from T. After losing a child, one cannot help but wonder, “Was it me?” T helped me deal with that answer. So powerful yet so simple, this glass bottle has become a special token in our home. Created by T, it is used to store anything he would like to say to B. It contains tiny pieces of paper, scraps of pictures….he has tried to put just about everything in this bottle! It is part of our healing process, which almost 17 months now, doesn’t seem to get all that easier. Sure, we smile and laugh, hug and cry, but the part of us that misses B just lingers. 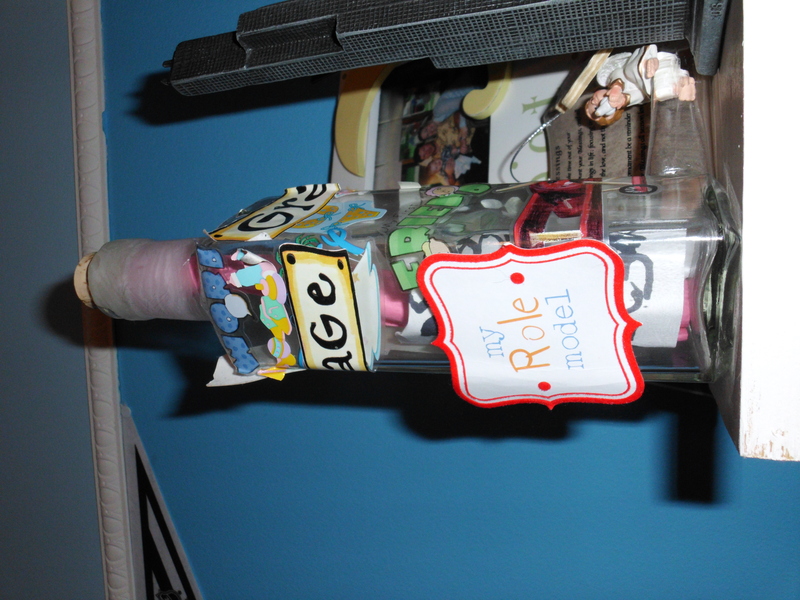 So, we send him messages in the bottle. Everyone needs a way to communicate their feelings; this one seems to work for us. We have been through the rage and depression, there and back again, and more may come. We continue to struggle with the unknown. However, writing to B seems to bring us some peace. We hope others find their way to peace as well. This entry was posted in bereaved parent, bereavement, children, death, death of a child, grief, healing, loss and tagged bereaved parent, Children, death of a child, grief, grieving child, loss. Bookmark the permalink. He’s able to help u because you have given him the tools by being great parents and doing everything you can to help him through this. He is working off of the example you have set!! You should all be proud. Isn’t something how a child has the capability to touch your heart with a simple gesture like a note? T is a special guy, who is going to pull everyone through with these acts of kindness and courage. T giving you a message from B… I get that you would have come unglued! It sounds like T is learning to write his way through heart ache; such a wonderful gift from his mother. I hear you saying it has been 17 months since your child passed. For me that kind of time was a blink, in fact, after 12 months the pain got worse because now I was measuring time since I had kissed my son’s face, in years. I fell deeper into the pit. You are going to take the rest of your life to live the rest of your life without your “lost” child. For now, just take it one day at a time. And it sounds like you are doing that the best you can. Thanks for another uplifting post. This is so beautiful. T must have a small part of B in his heart and is helping you heal through his own grieving process. I think the rituals you are doing with T to help him cope are just wonderful. I wanted to share that I, too, have had a harder time in the second year since losing my mom. I think a lot of the shock and numbness of that fresh grief in the 1st year is shed in the 2nd year. You are left with a painful new reality. I don’t think we ever stop missing someone. Our heart & soul must somehow find a new way to function eventually. I’m in it with you, though of course the loss of a child is much more profound. Jen, It was not you. It was not you. It was not you.